Listening to the song today makes me wonder if its emotional intent, if not its lyrics could also be applied to the 1979 Subaru 4WD wagon we looked at yesterday. I mean, with a massive 93 percent Nice Price win for its modest $2,300 price tag there certainly was a lot of love to be had. Love can make us do a lot of crazy things. It can compel us to get indelibly inked with the visages of others in evidence of our adoration. It can even get us to change who we are to please another. Of course, once that has been done, it’s possible that one or the other of you might fall out of love after having experienced the change. 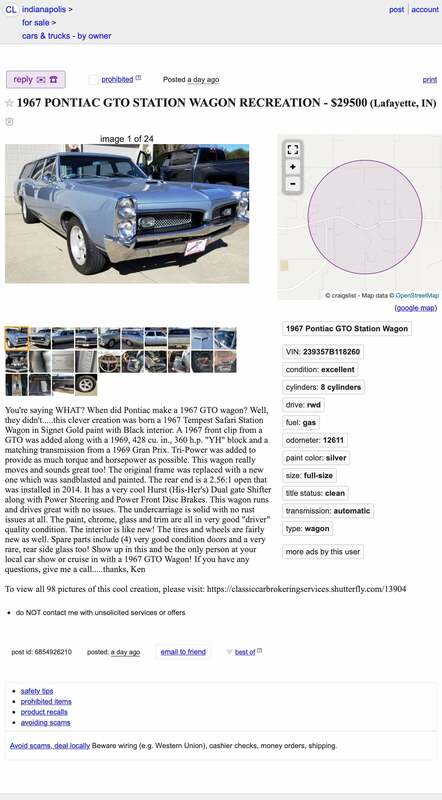 That’s potentially what has happened in the relationship between this 1967 Pontiac Tempest Safari “GTO” and its seller. That’s since there’s been a ton of work undertaken to massage the wagon into meeting the owner’s passions. That’s right, there never was a GTO wagon from the factory, making this one-off a home-built homage. You know what? I’m all kinds of digging it. First off, let’s note this week’s unintended time travel. We started out Monday in the present century with a BMW 135i, albeit one from the decade just past. On Tuesday we then slipped back almost 20 years with a 1988 Chrysler, and then went even farther yesterday with the Subie from ’79. Today we’re looking at a car that hails from all the way back in the ‘60s. This Pontiac is so old that it eschews pretty much all modern safety and emissions regulations having dodged the big Federal standards by a single model year. It’s so ancient that it even pre-dates man setting foot on the Moon. That being said, it looks like it will fit in the present era just fine. It will be an iconic reminder of the past—an age when people would hot rod big wagons. At over 200 inches long, this Safari is big. With its GTO kibbles and bits it’s also very likely every bit a hot rod. The biggest and most powerful engine the factory plugged into the Safari back in the day was a 250 (gross) horsepower 326 V8. This one is said to have a 428. That was one of the biggest displacement engines Pontiac produced, and with just a three-year lifespan, also one of its most limited in production numbers. Here that YH big block has been imbued with a Tri-Power intake and a triplet of 2-barrel carbs. The ad claims 360 horsepower and I don’t see any reason to doubt that. Also, it looks pretty badass, albeit in somewhat a need of some polishing. Backing up the big hairy V8 is a 3-speed THM. Both engine and transmission are said to have come from a 1969 Grand Prix donor. Gear changes are made through a funky Hurst Dual Gate “His n Hers” shift lever. This was an option on the GTOs of the time, and hence adds to the cosplay here. An open 2.56:1 pumpkin sits in back, and is claimed to have been a fairly recent addition. The ad says that the Safari rolls on a replacement chassis that had been sandblasted and painted before the pairing. Power steering and front disc brakes round out the mechanicals. You may notice I didn’t mention A/C. That’s because there ain’t any. The body looks pretty decent. The medium blue metallic paint is not the car’s original hue, and it does show some boogers here and there. There’s nothing here however that might keep you away from Saturday’s Cars & Caffeine out of shame. The entire front clip was replaced with a GTO unit and appropriate GTO badging has been applied liberally throughout. On the tailgate there’s some Von-Dutch like pin striping tramp-stamping things up. The interior is presented in similar kit. The black vinyl upholstery looks perfectly serviceable although not concourse worthy. More GTO bits may be found in here, including a wood-rimmed steering wheel with arrowhead badge. There’s even a period-correct 8-track player bolted under the dash. We’ll reserve judgement on the Billy Joel tape, however. Along with the car you get four extra doors and some side glass. The title is clear and the mileage is listed at 12,611, which on a mutt of a car like this doesn’t really matter all that much. How much does traveling back in time to experience something that never officially existed cost? In this case that’s an eye-opening $29,500. Before you wipe your now coffee spitted screen consider the market for ‘60s performance cars and just how reverently this Safari has been built. 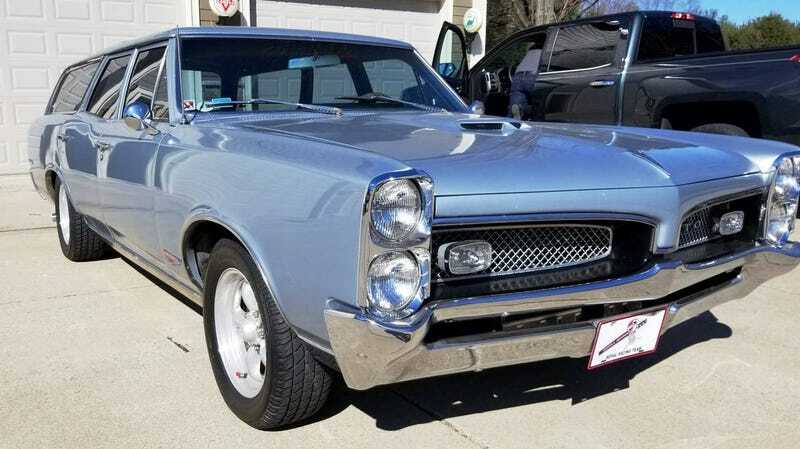 Based on those ruminations, what do you think—is this homage GTO wagon worth that $29,500 asking? Or, does that price make this never was a shouldn’t be?